Greg Wells was a champion centreman in his eleven seasons for Melbourne from 1969 to 1980. Recruited by the Demons as a 19 year-old from Bentleigh-McKinnon Youth Club in 1969, he went on to play 224 games and boot 251 goals. He won Melbourne's Best & Fairest award in 1971 and 1976, was runner-up in the 1972 Brownlow Medal, and captained the Demons in 1977. Durable, skilful and a strong mark, he represented Victoria on five occasions. However, back in 1973, Wells had fallen out with the Demons, and threatened to quit the club after Ian Ridley was sacked as senior coach. He trained with WAFL club Subiaco, and had talks with a number of other VFL teams – including Carlton – before he was eventually convinced to stay at Melbourne. Carlton's match committee chairman Wes Lofts was a huge fan of Wells, and from that time on, was determined to get the blonde terrier to Princes Park. Lofts tried again in 1973, saying he would happily trade "six or seven" players for Greg, only to be rebuffed once more. Then, two days before the deadline for mid-season clearances in 1980, Wells was stunned by the news that cash-strapped Melbourne had finally agreed to trade him to the Blues for an unconfirmed cash payment of $75,000, plus two players (eventually, Vin Cattoggio and Michael Young – who joined the Demons the following year). Indeed, Greg settled in quickly at Princes Park, and was valuable for the Blues in the last eight home and away games of 1980, as well as two consecutive deeply-disappointing finals losses. In the aftermath of those disasters, senior coach Peter Jones was shifted sideways to the club committee, and former Hawthorn Premiership coach David Parkin was installed in his place. 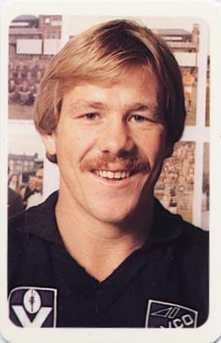 Under Parkin, Wells played consistently good football for most of 1981, culminating in a convincing 20-point win over Collingwood in the Grand Final. Greg’s experience was often vital, especially in the tight third quarter of the decider, when Collingwood threw everything at Carlton, but couldn't shake off a Blues outfit that finished all over them. Having won the flag that he craved for years, Wells saddled up again in 1982, only to find his opportunities being limited by emerging stars like Wayne Harmes, David Glascott and Jim Buckley - who kept Greg out of that year's back-to-back Premiership team. So, after 43 games for Carlton that took his career tally to 267, Wells retired from league football amid the euphoria of that '82 flag. Whilst there is no denying that he was an expensive purchase, Greg was an important cog in the engine room throughout Carlton’s 1981-'82 Premiership campaign, and his influence on the Blues’ emerging midfield stars of that time should not be underestimated. In 1983, Wells agreed to join the reformed Moorabbin Football Club in the VFA second division. He was appointed as the Kangas’ inaugural captain, and won the club’s Best and Fairest award after an outstanding season. When his playing career ended, Wells reconciled with the Melbourne Football Club and was appointed Chairman of Selectors. He served as the Demons’ Reserves coach, as well as an assistant to senior coach John Northey from 1986 to 1988. At the end of that year he made the shortlist for the vacant senior coaches’ position with the Sydney Swans, but was passed over. In 1993, Wells was again appointed Chairman of Selectors at Melbourne, and served on the club committee before retiring from both positions in 1995. Articles: The Longest Roads to Glory! Contributors to this page: Jarusa , Grisdesa , PatsFitztrick , pblue , Bombasheldon , molsey , tmd1 , dgreen2 , Andy , WillowBlue , nikki , BlueWorld and admin . Page last modified on Monday 15 of May, 2017 17:18:59 AEST by Jarusa. 1991 Rd 13 - Verbeek stretchered against Swans.